Feeling "Chucky" today? Transform into the iconic homicidal doll with this Child's Play Chucky Mask! Crafted in the tradition of classic costumes, this facemask is constructed of durable vacuformed plastic and secures to your face with a retro style elastic band. 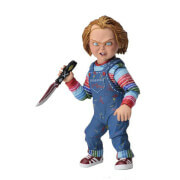 This Child's Play Chucky Mask comes packaged in a classic 2 piece window box that captures the menacing look of Chucky, the homicidal Good Guy doll. 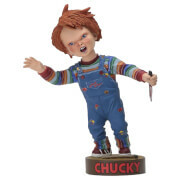 Perfect outside or inside the box, make this Child's Play Chucky Mask the focal point of your Child's Play collection! Box measures about 11 3/4-Inches long x 13-inches tall x 4 1/2-inches deep and mask measures about 11 1/2-inches tall x 10 1/2-inches long. Ages 15 and up.